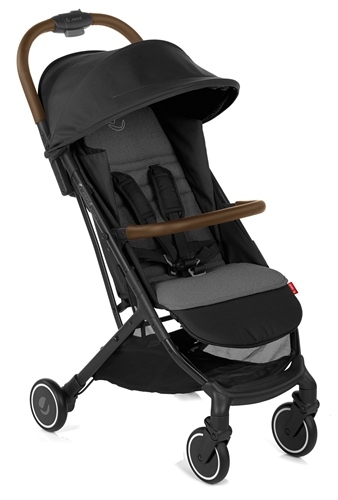 A light, urban, fully-folding pushchair with a quality finish. Ready to navigate the city with family, with friends, while shopping, at the cinema…How and where you like, the rocket pushchair and its versatility will make your walks and outings easier and more practical. Compact folding system, hand luggage size. Easy to carry lightweight aluminium chassis 6.4 kg. Synthetic leather handle and protector bar. Hood with built-in sun visor. Handy storage pocket and large sized basket. Adjustable backrest and footrest by optimal comfort. Synthetic leather handlebar and bumper bar. Single handed folding and steering. Compact folding 49 x 56 x 28 cm, hand luggage size. Automatically locks closed when folded. Very lightweight at only 6.4 kg, makes it easy to carry.